Can be connected to an app, sizable running deck, foldable to save space, comfortable suspension, fashionable design, electronic inclination adjustment, quiet running. Single-handed plastic 10 kg dumbbell, bell-shaped, cement filling. 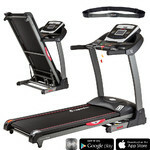 Treadmill inSPORTline inCondi T50i is a high-quality treadmill suitable for home use. 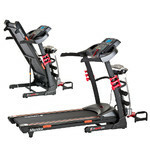 The treadmill has a variety of functions and safety features, for example a sophisticated control panel with a back-lit LCD display, a motor with maximum output of 2.5 HP or 15 electronically adjustable inclination levels. 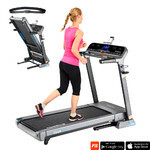 You can connect the treadmill to your tablet or iPad through Bluetooth and the FitShow app. The back-lit LCD display shows all the information you may need – speed, time, distance, heart rate frequency or the number of burnt calories. 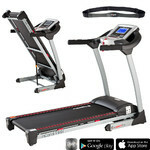 Other advantages of the inSPORTline inCondi T50i treadmill include quiet running, handlebar heart rate sensor, 20 km/h maximum speed or wheels for easier transport. The sturdy frame with a 140 x 51 cm running deck and 140 kg weight limit guarantees comfortable running and high durability. To ensure the user’s maximum safety, the Treadmill has a safety key, that can be pulled out to immediately stop the running belt. The safety key can be attached to your clothes with a clip. To achieve the most accurate results, the control panel offers 24 pre-set programs, 3 user programs, 2 HRC programs and a manual program that allows you to adjust settings exactly according to your needs. Additionally, the control panel has a holder for your smart devices with maximum screen size 10ʺ. You can connect the tablet to the FitShow app or play music and videso through the audio cable (3.5 mm) and make use of its high-quality loudspeakers. 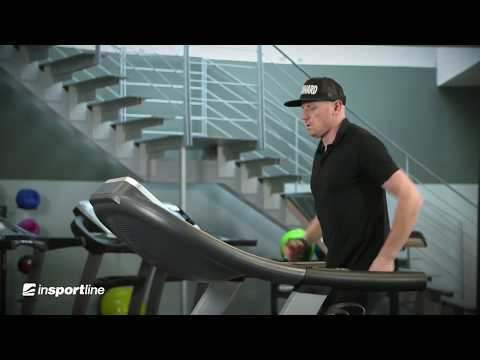 Lukáš Rosol, a professional Czech tennis player, recommends running on inSPORTline treadmills. The higher the output, the higher the user weight limit. Treadmills with high output can also move faster. 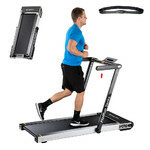 Running deck inclination is one of the most important aspects of a treadmill. 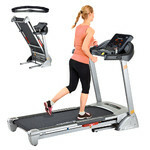 The outmost majority of motorized treadmills feature electronic inclination. Cheaper models either have fixed or manually adjusted inclination. Generally speaking, the longer the running deck, the more comfortable exercise the treadmill provides. For taller people, minimum recommended running deck length is 140 cm. Running decks on professional treadmills are suitable for everyone. The total numner of pre-set and user programs, manual mode and HRC program (if applicable). User programs are programs that can be set according to the requirements of the user and saved into the memory of the treadmill's console. A tablet holder doesn't have to be used only for a tablet. You use it to prop up a book, magazine or a mobile phone. A necessary part of every treadmill - a magnetic safety with a clip attached to your clothing that, when pulled out, immediately stops the treadmill. If the treadmill features an audio jack (3.5 mm), you can connect it to your phone and replay music through inbuilt loudspeakers. Treadmills without motor are moved via the force created by the user's legs and subsequent inertia. Motorized treadmills feature and electric motor that moves the running deck. On these treadmills, you can adjust the running speed at will. Generally speaking, the heavier the treadmill, the more robust it is and the longer its service life. The weight of professional treadmills can far exceed 100 kg. Most treadmills are powered via 220/230V outlet. Treadmills without motors only require batteries for their control panels. Category according to EN standard: H (Home use) for home use, S (Studio) for commercial and club use. The letters A, B and C denote the presicion of data measurement. 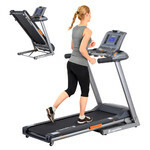 Home treadmills are suitable for home use only. 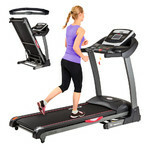 The higher-quality club treadmills can be used in hotels, school gyms, public gyms, etc. Commercial treadmills can be used anywhere, mainly in professional commercial fitness centres. 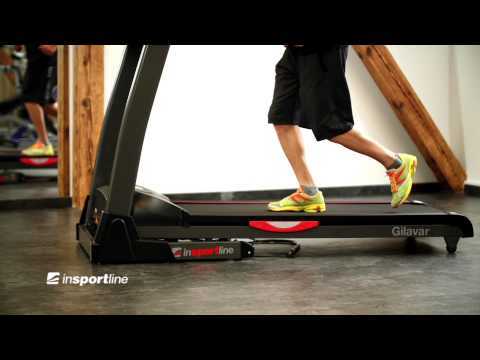 Treadmills inSPORTline inCondi feature a technology that connects them to smart devices via an app. 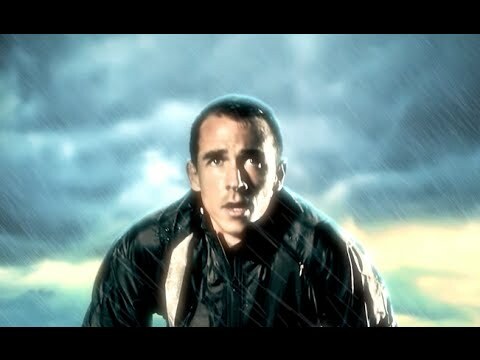 This way, you can experience training on a whole new level. You can also save your results and follow your long-term statistics. How to Exercise with a Treadmill?